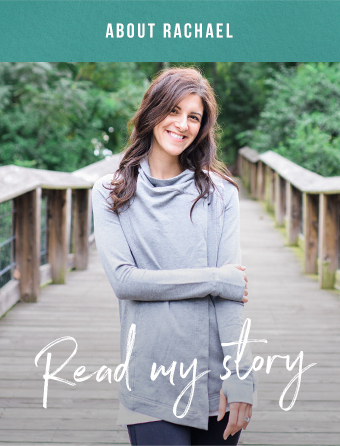 In the talk, I shared that when I first became a dietitian, eating disorders were one area of nutrition I was 100% sure I did not want to work in. Twenty-two-year-old Rachael got a lot of things wrong! Obviously, things have changed, as my entire dietetics practice is centered around helping clients nourish a healthier relationship with food, and a good chunk of that is working with people with eating disorders or disordered eating. Why was I so opposed to working with eating disorders? Because I had a very specific view of what eating disorders were, a view that was shaped by documentaries shown in high school health class (which I think were supposed to scare you out of developing an eating disorder? As if it’s a choice), and a medical nutrition therapy curriculum that taught eating disorders under a very narrow lens. As I started learning more about intuitive eating and Health at Every Size, I felt a lot of shame realizing how much I misunderstood eating disorders and disordered eating. Now I feel angry, because I realize it’s not because I wasn’t listening, but because I wasn’t told. There are so many misconceptions about eating disorders, within dietetics, and in the general population, and that’s created a world that’s really dangerous for those with eating disorders or at risk. It prevents people both from asking for help when they need it, and receiving adequate care when they do. This week is National Eating Disorders Awareness Week, and the theme is Come as You Are. The theme is meant to promote inclusivity in the eating disorder community, and let people whose stories don’t fit the traditional eating disorder narrative know that their stories and experiences matter, and that they deserve help. As part of that, today I’m things I wish more people understood about eating disorders, to help break down the myths and misunderstandings that my be preventing you from getting the help you need. Eating disorders occur at every weight and size. When you hear eating disorder, what comes to mind? A thin, or even emaciated appearing young woman? While that can be someone with an eating disorder, eating disorder’s do not have a specific look or size. All eating disorders - anorexia, bulimia, binge eating disorder, ARFID, etc - can occur at any weight or size. In fact, most people with eating disorders are not underweight. Yet the idea that someone has to be very thin to be “sick enough” for help is super prevalent, and a huge barrier for receiving treatment. If food and eating is interfering with your mental of physical health, you are sick enough. Eating disorders occur at similar rates among all races and ethnicities. Despite this, people of color are significantly less likely to have their disordered eating behaviors viewed as problematic, and be referred for treatment. This is especially true for African-American women - one study found that when presented with identical cases, 17% of clinicians identified the black woman’s behaviors as problematic as compared to 44% of clinicians for the white woman. People of color may also experience many additional environmental/societal factors that increase the risk for disordered eating, including racism and greater amounts of weight stigma. Eating disorders are not a choice. Often I see eating disorders presented as a diet gone out of control. Sometimes, that is how an eating disorders develops, but EDs are so much more complex than that. There’s the aforementioned genetics - I’ve seen clients where unintentional weight loss from an illness has triggered disordered eating in someone who was genetically susceptible. There’s also food insecurity (i.e. lack of reliable access to foods), which can often replicate disordered eating patterns as one runs low on foods the further away from their paycheck. Trauma is another hugely significant factor in eating disorders that’s commonly overlooked. The majority of people diagnosed with anorexia, bulimia, and binge eating disorder have experienced interpersonal trauma. For many trauma survivors, disordered eating behaviors are a coping mechanism that has helped them survive some really tough things. If you’ve experienced trauma, processing it and learning new coping skills needs to be part of treatment. People of all genders can develop eating disorders. Eating disorders are thought of as a woman’s issue, and while women are more at risk (partially due to greater societal pressures to look a certain way, and a higher risk of trauma/PTSD), 25% of people with anorexia and bulimia, and 35% of people with binge eating disorder are men. Men are also at a higher risk of dying from an eating disorder because they are frequently diagnosed later. Although there is woefully little research that has been done on eating disorders in trans communities, we do know that people who identify as trans are at some of the highest eating disorder risks, and have very few options for inclusive treatment. People with eating disorders may have other chronic illnesses. This may seem obvious, but is often forgotten - people who are struggling with an eating disorder almost always have other co-occurring conditions, whether it’s a mental health diagnosis like depression or anxiety, or another medical condition like IBS or diabetes. If you have multiple diagnoses, this can feel complicated, like you have to be doing different treatment “protocols.” One thing I run into with clients is this idea that food can “cure” their condition. They follow a restrictive diet in hopes of healing, but all it’s doing is making the disordered eating worse - and in most cases, the co-occurring condition too. Restriction isn’t just about weight and calories. Orthorexia, an obsession with “clean” or “pure” eating, may not be an “official” DSM-5 diagnosis, but it can be just as dangerous as any other eating disorder. Unfortunately, because clean eating has become so culturally accepted, many people struggling with orthorexia may not realize how sick they are because their restrictive eating behaviors are lauded. There’s also Avoidant-Restrictive Food Intake Disorder (ARFID), which can be a bit of an umbrella term, but essentially is a limitation on the types and amount of food consumed without distress about body size or weight. It’s often likened to extreme picky eating. Binge eating disorder is an eating disorder, and it’s not treated with a diet. Because the word binge has become such a commonly used phrase in our lexicon (“binge” on Netflix), and because binge eating is associated with large bodies, many people don’t realize that binge eating disorder is in fact an eating disorder, and a life threatening one at that. It’s characterized by frequent episodes of eating large quantities of food to the point of extreme physical discomfort, accompanied by a sense of deep shame and feeling out of control. People of all body sizes can struggle with binge eating, and it is NOT treated by dieting or restriction. In fact, restricting food frequently makes binging worse. This is a place where weight inclusive care is especially important. If eating is affecting your quality of life, you deserve treatment. It doesn’t matter whether you perfectly fit within the criteria of a diagnosable eating disorder, look like what you think someone with an eating disorder should look like, or think that you’re sick enough - if eating is affecting your quality of life, you deserve help. NEDA has a helpful screening tool and free and low cost resources for support. I provide weight inclusive nutrition therapy in Columbia, SC, and recovery coaching virtually throughout the US. Read more about my practice philosophy and email me if you’d like to see if we’re a good fit to work together, or I’ll be happy to connect you with someone in your area. What do you wish more people understood about eating disorders?